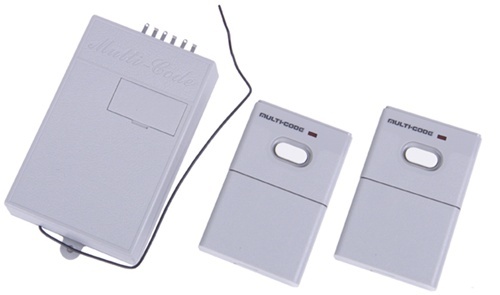 Multi Code 300 MHZ 2 Remote Control Transmitters and 1 Receiver Kit. Includes Visor Clips and installation instructions. Multi Code 2022 two transmitter and receiver kit. 300mhz operation. Transmitters operate on 9 volt batteries included. Works on most residential and commercial garage doors and gate operators that are set up to accept external radio receivers. Programing and installation instructions included. Multi Code 2 transmitter and 1 receiver kit. This kit can work as a direct replacement for any commercial or residential electric garage door opener.